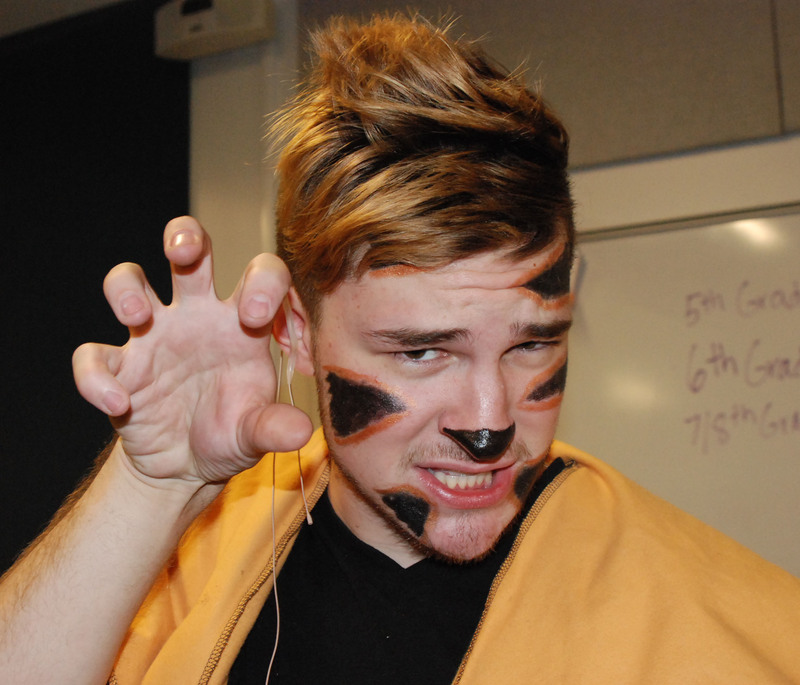 Shere Khan played by Chis Catania. Chris led the backstage preparations before the show. Being backstage on show nights is always a lot different than being in the audience. After people get dressed, it’s time to come together as a cast, a crew, even a family. It only took one unusually loud voice belonging to a certain tiger-playing senior to get everyone to drop their pre-show jitters, rehearsing of lines, or, if you were like myself, checking Facebook and texting family members. Chris rubbed his hands together, and soon we were lion facing and lemon facing it up. We laughed, having fun, forgetting the fears of having to go on stage soon. Finally, it was my turn to lead the group. I instructed the group to clasp hands, and reminded them of what it was we did before every performance: sing together. We hold hands and sing a song from Fiddler on the Roof, last year’s musical, with some edits to it so it can fit. After we sang, it was getting close to raising the curtain, and going on stage. But first, we had to do the Hokey Pokey, which involves a lot of laughter and dancing around. It’s not a show without it! After singing, dancing and laughing, led by Chris Catania again, we parted so we could go get ready. Of course, ready or not, we had to go on. We didn’t have many mistakes, but sure, sometimes words were mixed up, saying the wrong line at the wrong time, or a pause when someone forgot to speak. However, everything worked out, as the play was a great success. Being backstage is joyous, a feeling I’d greatly recommend to anyone. If you are interested, in the spring, the Theatre Guild will be swinging to the basketball court next with their production of High School Musical. Be sure not to miss your last chance of seeing a play performed by the RHS seniors and if you have a hidden talent of singing, dancing, or dribbling a basketball, show it off on stage and audition in January to have the opportunity to be in High School Musical.